The picture really does remind one of a Henri Rousseau painting. I am not sure I would have zeroed in on that right away, but as soon as you drew my attention to it it was right there! I was a little surprised how quickly I made the association. I’ve not studied Rousseau, and I don’t remember ever seeing one of his paintings in a gallery or museum, but somehow he must have made enough of an impression on me that I was able to make the connection when I saw the photo. I can clearly see the Rousseau reference and love the bits of red throughout. Lovely. It pleases me that you see the Rousseau-like qualities. I like the bits of red, too. Maybe we should call the photo “Red Weed Times”! “Unfurl” is just the right word for these buds. Many’s the time I’ve photographed that stage, so appealing is it. Years ago I was puzzled when a native Texan friend referred to these flowers as buttercups. She said that when she was growing up kids used to rub open pink evening primrose flowers on each others’ noses to make them yellow. It’s the yellow pollen rather than the flowers’ color that was the important thing in the kingdom of childhood. As they open, they do seem to resemble an unfurling sail. 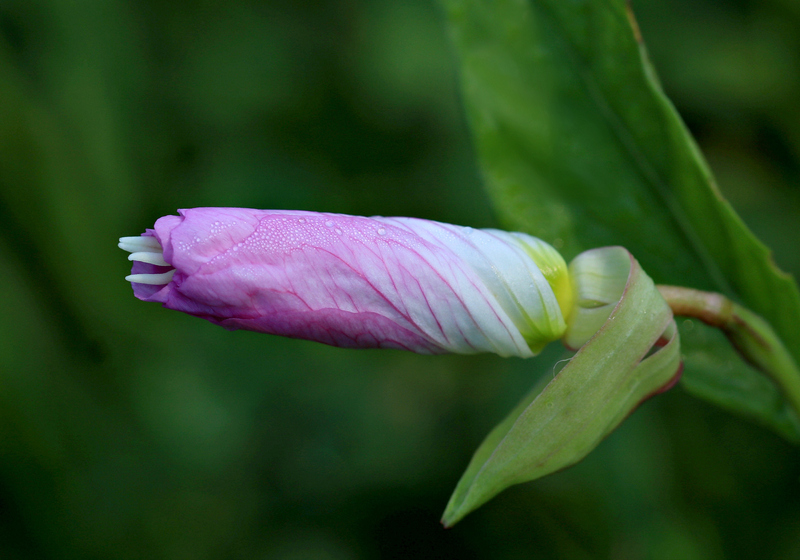 The biggest difference is that a flower, once open, can’t be furled again. That’s interesting about the pollen. We used to hold dandelions under each other’s chins; if our skin turned yellow, we were said to like butter. Since the pollen transferred pretty easily, almost everyone did. One of the side benefits of learning the scientific names of plants is the window it opens into our everyday language. I’ve always thought of ‘specious’ as a purely negative term, so it’s interesting to know that it started out as a positive. Oenothera speciosa is a scientific name I can remember, but I’d missed that connection. The first definition in Webster’s Dictionary of 1828 was still the positive one. You are really finding some great locations. There are so many different names for the same plant. I see Mexican made it in. So many different common names are the reason I decided to try to learn the scientific names. It not only made conversing with ‘plant people’ easier, it actually began to help with identification. If I can recognize the family a flower belongs to, I can at least spend my time searching there, instead of just looking for a ‘pink flower,’ as I did in the beginning. I found the bud along FM 108S. I’ve discovered that one of the best things about stopping on farm-to-market roads is getting tips from passers-by. There’s nothing quite like having a guy in boots and jeans lean out of his big ‘ol ranch truck and tell you there’s some gaura blooming down the road. I had that happen years ago near Eagle Lake when looking for Bluebonnets. After we made it to town, they asked if we wanted to move there. They were looking for a younger population. I passed through there on my way to Gonzales. Sadly, it looks as though they might still be looking for a younger population, although appearances can be deceiving. I didn’t realize that there’s a nice boardwalk and wildlife viewing area at the lake now, or that Wildseed Farms in Fredericksburg has 800 acres in production at Eagle Lake. That calls for more investigation. We would now be part of the older population. :) All those years ago, we were not allowed to be near the lake. I too grew up calling them buttercups. Love them when they are awash in color on the sides of the highway. I noticed today that they’re really beginning to spread down here. Vacant lots that weren’t showing a single one a few days ago have nice, large colonies forming. They ought to be decorating the highways with enthusiasm before long. Your primroses are indeed lovely, Linda. And yes, spot on with the Rousseau connection. I see that too! It doesn’t surprise me that your artistic eye spotted the Rousseau influence. It’s a good reminder that context makes a difference in how we perceive a flower, too. The same plant looks quite different when it’s isolated in a pot, and when it’s joined together with some friends in a garden — or an nice, natural setting. Around here, we’ll take all the air testing we can get. Who knows? A primrose may be more trustworthy in that regard than that various corporations and governmental agencies who are telling us that our air is just fine, thank you. (That may be an unnecessarily cynical view of our recent unpleasantness with the ITC fire, but then again: perhaps not.) Now that you’ve suggested the flower might be sticking out its tongue, that’s all I can see! It’s been fun to learn how many people learned to call these buttercups. The name makes sense when I switched my thinking from “a cup made of butter” to “a cup containing butter” — i.e., pollen. Are/were you directly impacted by the fire? I guess I assumed you’re futher away from it than you are. I’ve read the many comments about calling these flowers buttercups. What Steven says reminded me why we called them buttercup: the pollen on the noses!! I remember doing that/having it done to me. What a nice reminder of childhood! I wasn’t affected as far as air quality’s concerned. I live and work south of the fire, so the winds kept the smoke to the north of me. There’s a lot of concern about water quality though, since fire-fighting foam and contaminants escaped. I’m waiting for the reports from the Galveston Bay Foundation; they’re usually the best source of information. We did the same pollen trick with dandelions. It was great fun — and no batteries required! You’re sending me once again down that memory road to yesterday, and I am again on my horse and stopping to decorate my horse’s mane/bridle, etc with the primroses and other flowers that grew at the ‘back side’ of the farm! I cherished my times there, where I delighted in all unexpected bursts of colors from flowers along the marshy area. Your childhood does sound idyllic. It clearly helped to lay the groundwork for your later appreciation for nature, and you willingness to immerse yourself in art that conveys its beauty to others. Did your horse’s gait become just a little more sprightly when you added the flowers? I always tell my customers that fresh varnish makes their boats go faster! “Fresh varnish makes their boats go faster.” How fun, and it makes sense – could that in fact be true? less drag? Your posts have veered me down memory lane (cotton-field turn rows) so many times that I should write a post instead of leaving a long-winded comment! Actually, on most boats here the fresh varnish is more akin to a fresh lipstick than a new dress. Since our boats are mostly fiberglass rather than wood, there’s no varnish to ease their way through the water. That’s the job of super-duper paints. But, yes — a good paint job, especially on the racing boats, does reduce drag, however minimal the effect. I love your comments, and never have thought of them as long-winded. Interesting that I’ve been thinking of doing a post about cotton fields myself. I drove through part of our cotton country last weekend, and saw the farmers finally have been able to get in with their equipment to do some plowing. I even saw some fields with new crops peeking out of the rows, but I’m not sure what I was seeing. Time will tell! Now wouldn’t that open primrose flower make a wonderful painted china plate to eat petit fours off of? It would. 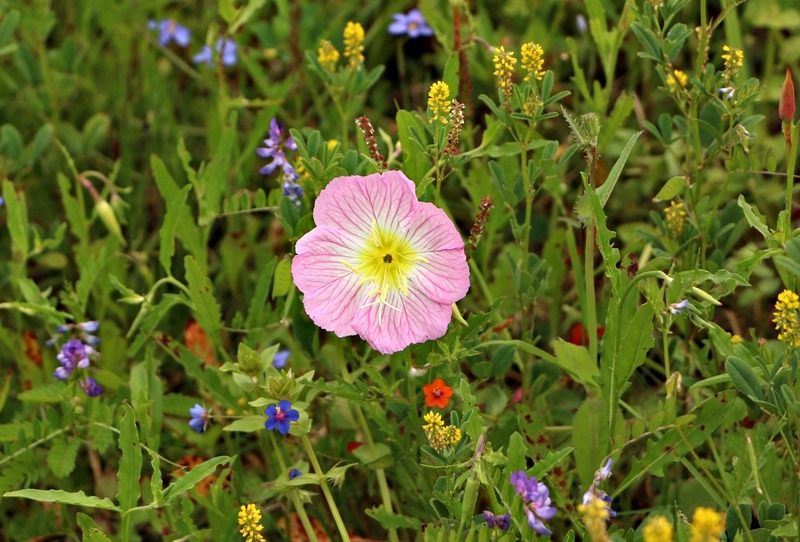 If we really wanted to go all out, we could decorate each tiny cake with a tiny pink evening primrose. It would be so pretty they’d be hard to eat, but I’d force myself. Well I’ve enjoyed this post, and the comments. And glad to learn about “specious,” I hadn’t ever run across it used as a positive. I’ve also never seen a flower pop open while I watched, that’s pretty neat. I did used to bug my grandmother’s “touch-me-not” plant, which would do the opposite, close up its leaves when you ran your finger up them. Isn’t that interesting about ‘specious’? I’ve certainly heard a few specious arguments in my life, and none of them was particularly positive. Up until the day I watched the blue-eyed grass open, the only opening flower I’d watch was a red and white striped lily in Liberia. It bloomed once a year, under the full moon, and opened two or three nights. People would have lily-watching parties, sitting outside drinking beer and watching the flowers open. We have a couple of wildflowers in the mimosa family that will do that leaf-closing trick. It’s great fun to watch. Around here I guess we have plenty of plant birthdays as naked branches are bursting with green. But, I’ve certainly been focusing on bird birthdays lately and bunches of species are warming their pretty blue eggs still. I was thinking about you today when a flock of black-bellied whistling ducks landed in a tree near me — actually, in the middle of a cemetery. At the time, I was trying to photograph a squirrel in a hollow limb. I suspect she might have had a nest in their — this is the time of year for birthdays all around! Thanks, Tom. They really are beginning to bloom here now, and they’re just so pretty. They seem to adore vacant lots — room to spread out, I suppose! As a child, I learned to call these butter cups too. I especially like to see vast colonies of them open in the morning. I have always been disappointed to find them closed as the afternoon arrives. A lovely photo here, Linda. You’ll appreciate my confusion over the Texas dandelion, Yvonne. There used to be a field filled with them that I’d pass every day on my way to work. When I’d come home at the end of the day, they were gone — or so I thought. It took me much longer than it should have to figure out that they open in the morning, but close by noon, or shortly thereafter. It really was something, to have a whole field of flowers seem to disappear into thin air. The good news is that a new morning brings new flowers! I have been there and done that too. Wow Linda, what a wonderful collection of wildflowers and the Primrose is so delicate in a flowing, summer-dress kind of way! : ) But do you happen to know what those tiny, rusty-red-brown flower clusters are? There’s nothing like a good summer dress — what a perfect analogy. As for those rusty-red bits, I’m not certain. I think there’s a species of plantain (or something similar) that’s in the process of going to seed. The color isn’t their bloom, but their seed. I will, indeed. I was tickled to find IDs for three plants yesterday. Three down, a gazillion to go! I love the Oenotheras, and that bud! Gorgeous! The open blossom is stunning too, and what a riot of color all around it, no wonder you thought of Rousseau. Now that I’ve seen this bud “sticking its tongue out,” as someone said, of course I came across the same phenomenon with a completely different plant a couple of days ago. I swear, the more we see, the more we see. As for the landscape, I’ve seen Matisse landscapes and O’Keeffe landscapes, but I never thought I’d see a Rousseau landscape. It was great fun to discover it. I found a yellow beach primrose last weekend, and it has a square bud, as well as that different color. I can’t even tell you how many primroses there are. It gets confusing for me, partly because flowers in completely different families are given the common name primrose. The comparison of the second image to Rousseau’s painting is apt, I think, and I am sure there is more than one creature within the frame, hidden from view but there just the same. Maybe even a tiger beetle. I just learned there are forty-seven species of tiger beetles in Texas, so surely one is tucked away in there. Look at this beauty. He looks like he’d fit right in. So many beautiful beetles and other insects in the world. Too bad so many just concentrate on the less desirable like house flies and mosquitoes (I must admit to a renewed hatred of mosquitoes). Here’s my favorite beetle, although not a tiger, which you saw on my blog a few years back. Actually hard to pick just one. I certainly remember that beetle. It still looks to me like it out to be replicated as a piece of jewelry. Everyone seems willing to wear butterflies, but beetles? Not so much, except for lady beetles. I suppose part of that’s due to the fact that, at least down here, the black and brown and not so attractive beetles are more common. Some wear living beetles. It does seem that many of the more exotically beautiful beetles occur outside the U.S. Uh — I’ll leave that to others! Yeah, having something crawling around on you might be just a bit unsettling.